A simple example of converting a Pandas dataframe to an Excel file with a chart using Pandas and XlsxWriter. # using Pandas and XlsxWriter. # Create a Pandas dataframe from some data. 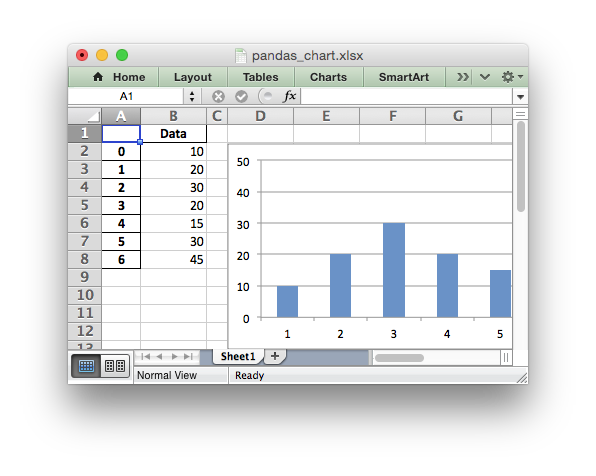 # Create a Pandas Excel writer using XlsxWriter as the engine. # Convert the dataframe to an XlsxWriter Excel object. # Get the xlsxwriter workbook and worksheet objects. # Close the Pandas Excel writer and output the Excel file.